Toddler Approved! : How Do I Defeat the Mean Mom in my Head? 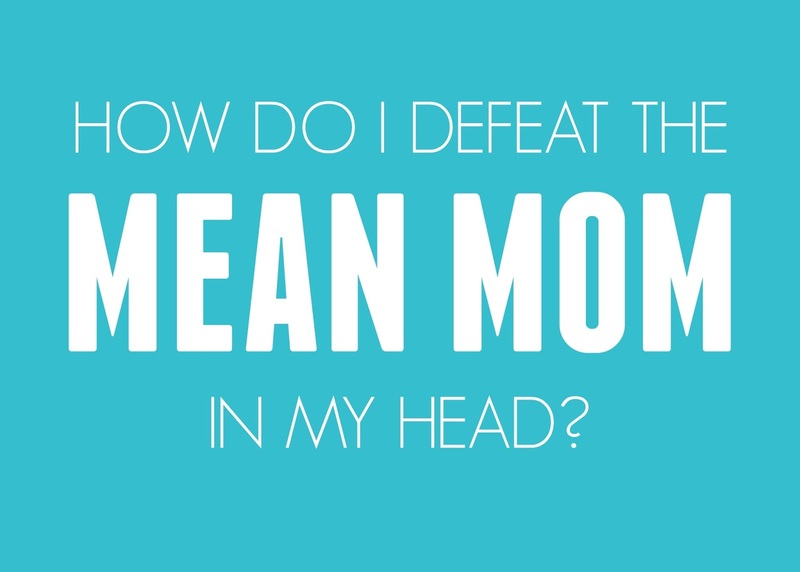 How Do I Defeat the Mean Mom in my Head? It is Sunday night and the sink is half full of dishes. I tell myself that I will just finish them up in the morning because I am too tired... Like clockwork that cues the mean mom in my head to remind me of all of the others moms/dads out there that would have done the dishes before they went to bed so that their kids could wake up to a clean kitchen and a happy send off in the morning. Ugh! Has that mean mom (or dad) ever stopped by your house? What is she usually bugging you about? 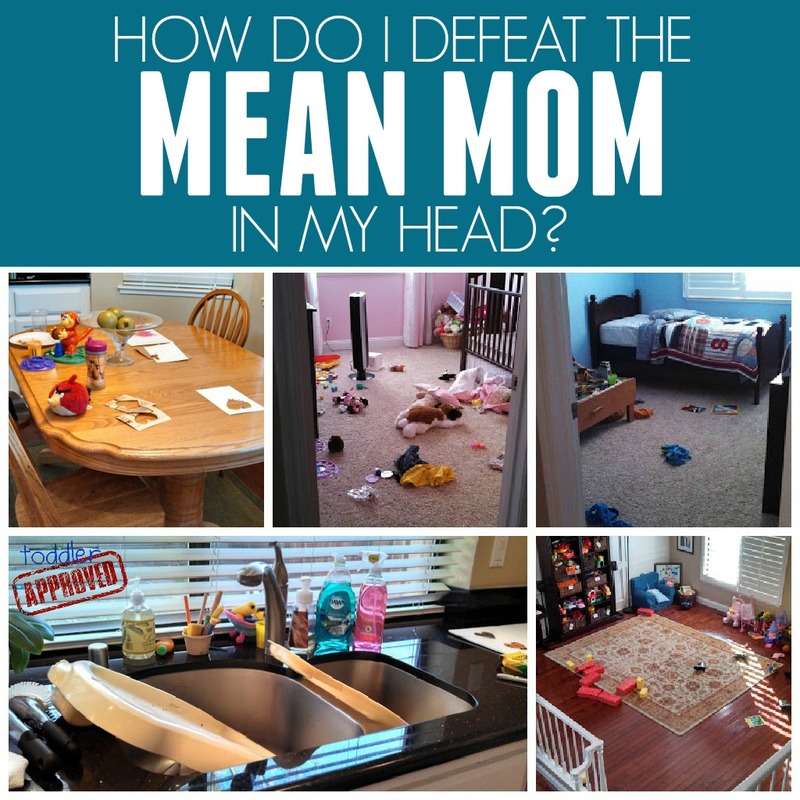 The mean mom's arrival turns my positive attitude upside down and gives me a big pit in my stomach as I start to question whether or not my kids would be better off with a more on the ball, energized, healthier, and organized mom. On Saturday morning we dropped my oldest off at baseball practice and then got the other three kids breakfast and headed over to his game. We were late, which rarely happens. We missed watching him pitch and the evil voice in my head arrived in full force shaming me and reminding me that if I had just woken up an hour earlier or gotten ready faster we would've been on time. On a daily basis I have this little mean voice pop into my head and criticize me. It bugs me about the food I send the kids for lunch, the type of clothes I let my kids wear, the amount of time I let them have screen time, how often I let myself have a treat, the piles of laundry I have, and how infrequently I make my bed... to name a few! I am not prone to depression but the constant little digs start to add up and while most days I brush them aside, days when I am under slept and overwhelmed they are magnified and cause me to get pretty emotional. As a mom I feel like I know less and less every day. Since I know that it isn't good for me to let these mean thoughts stick around, here are a few strategies I've been using lately to get them to go away or at least pipe down a little quicker! 1. Take a minute and jot down a few good things that I do each day. I am really good at finding fun activities to do with my kids and celebrating important events. I also have a pretty good memory. Typically I naturally give myself a compliment and then think of another negative thing about myself as I give a compliment. I have been trying really hard to repress those negative things! 2. Go and do something nice for someone else. If I am not feeling good about myself it really helps me to look outside myself and do something nice for someone else. Often when I am doing nice things for other people I get to know them better as well. Often I will discover that a friend has a similar weakness to me. Talking about our weaknesses and how to overcome them or just commiserating over our challenges can sometimes help me realize that I am not as hopeless as I thought. Talking with parents in other stages also helps me realize that some of the stuff I am stressing out about won't make a big deal in the long run. 3. Pick one thing that is bothering me and work on it. A lot of times the things the "mean mom" is saying have some (or a lot of) truth to them. By looking at my list of faults realistically sometimes I find a good goal to work on. Often I stand in the grocery line looking at my groceries and I tell myself that I am such a bad mom for buying my kids XYZ. I compare myself to other moms who buy healthier things and put myself down. Instead of putting myself down lately I have started to consciously make some better choices when I buy food for our family. We definitely still buy treats but I've added some other things that help me feel better about what I am feeding the kids. With a newish baby I am still trying to find our new "normal." Reminding myself of that helps me try and prioritize the most important things I need to work on right now... and push aside some other less important things that I can focus on in a few months when we are sleeping more and less frazzled. 4. Intentionally decide to ignore the mean mom and tell yourself why. On crazy days when I am overtired and overburdened with laundry I will sometimes survey what is going on in our house and I will intentionally decide that the mountains of laundry are less important that playing with my 3-year-old and baby and going running. Last Friday I left two huge piles of laundry and strapped my two little ones into our jogging stroller and went off running for an hour while my big kids were at school. It was amazing. The mean mom in my head went away quickly once I was outside listening to music and enjoying the gorgeous weather. Being intentional about how we spend our time is very helpful! By creating a plan and deciding why or why not I am doing things helps me feel less out of control and I tend to put myself down less. 5. Go spend time with happy positive people that buoy me up. I am fortunate to have a lot of amazing friends that are kind, happy, and positive. Whenever I am feeling down on myself, spending an evening out with them or hanging out at the park chatting can help turn my attitude around. Talking about challenges as a parent can really be put into perspective as we talk and realize that we are often going through similar things. Getting advice from moms who have gone through similar stages can also help. Doing less means we spend less time driving around and more time together. It means that we are able to hone some of our routines and be a bit more organized. Although we aren't able to do less all the time, on the days when I keep our schedule clear and we just get things done at home and spend time together we feel so productive. I have found so much joy in the mundane as a mom once we get in a groove and things are consistent and we actually have time. I try and remind myself that my kids aren't missing out by not having a life overfilled with extra-curricular activities. Instead they are benefitting from a life where they have time to run around outside, play with friends, and enjoy nature. They also have time to do kind things for others, help around the house, and get their school work done. As I use these strategies I am hoping to get better at sending the mean mom away quicker so that I don't spend my precious time putting myself down as a parent. If you've ever had a negative mean mom in your head, what strategies have helped you to defeat her? 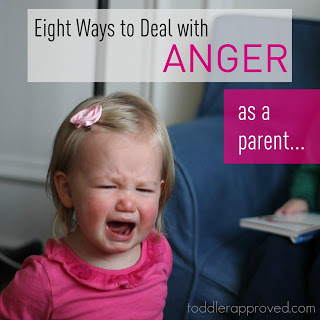 If you liked this post you might also like my post on 8 Ways to Deal with Anger As a Parent. Number 2 and 3 are my favorites! Helping others always brightens my spirits. And number 3 has been a strategy I have used for a long time. For instance, if I feel like life is out of control, I clean a drawer. Just one will do it. If things are particularly challenging, I may go back and OPEN the newly neatened drawer and look at it for a while. LOL!